It seems like a minor miracle, more like a magician’s trick than the work of a Messiah. It prevented a little embarrassment, but didn’t really address human suffering the way that Jesus’ healings did. It was a private miracle — done without the knowledge of the main beneficiary — and yet it was a sign that revealed Jesus’ glory (John 2:11). The literary function is puzzling. John knew of many more miracles than he had room to write about, and yet he chose this one to begin his book. How does it help achieve John’s purpose — to help us believe that Jesus is the Christ? (John 20:30-31). How does it show that he is the Messiah, rather than a magician (as the Jewish Talmud later claimed him to be)? We can start by examining the story in closer detail. It begins with a wedding in Cana, a small village in Galilee. The location does not seem to be important — what is important is that it was a wedding. Jesus did his first messianic sign at a wedding festival. Weddings were the biggest and most important celebrations among the Jewish people — the weeklong party signaled the social status of the new family in the community. Weddings were such joyous occasions that when people wanted to describe the blessings of the messianic age, they often used a wedding banquet as a metaphor. 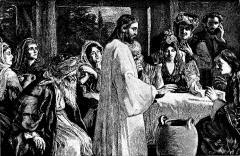 Jesus used the image of a wedding banquet to describe the kingdom of God in some of his parables. Jesus often used miracles in the physical world to demonstrate spiritual truths. He healed people to show that he had the authority to forgive sin. He cursed a fig tree as a sign of coming judgment on the temple. He healed on the Sabbath to show his authority over the Sabbath. He raised people from the dead to show that he is the resurrection and the life. He fed thousands to show that he is the bread of life. And here, he provided abundant blessings for a wedding to show that he is the one who will provide the messianic banquet of the kingdom of God. When the wine was gone, Mary told Jesus about it, and he said, “Why do you involve me?” (v. 4). In other words, what does that have to do with me? “My time has not yet come.” And yet, even though it was not yet time, Jesus did something. John signals here that what Jesus is doing is somehow ahead of its time. The messianic banquet is not yet here, and yet Jesus did something. The messianic age was beginning, long before it would arrive in its fullness. Mary expected him to do something, for she told the servants to do whatever Jesus said. Whether she expected a miracle, or a quick trip to the nearest wine market, we do not know. Now, it so happened that six stone water containers stood nearby, and they were not regular water jars, John tells us — they were the kind the Jews used for ceremonial washing. (For ceremonial cleansing, the Jews preferred water from stone containers rather than clay pots.) They held more than 20 gallons of water each — far too heavy for picking up and pouring. That’s a lot of water, just for ceremonial washing. This must have been at the largest estate in Cana. This seems to be a significant part of the story — that Jesus was going to transform some water used in Jewish ceremonies. This symbolized a transformation in Judaism, even the fulfillment of ceremonial washings. Imagine what would happen if guests wanted to wash their hands again — they would go to the water pots and find every one of them filled with wine! There would be no water for their ritual. The spiritual cleansing of Jesus’ blood superseded ritual washings. Jesus has fulfilled the rituals and replaced them with something much better—himself. The servants filled the containers to the brim, John tells us (v. 7). How appropriate, for Jesus filled the rituals completely, rendering them obsolete. In the messianic age, no space is left for ritual washings. The servants drew some wine out and took it to the master of ceremonies, who then told the bridegroom, “Everyone brings out the choice wine first and then the cheaper wine after the guests have had too much to drink; but you have saved the best till now” (v. 10). Why do you suppose that John records these words? Was it advice for future banquets? Was it merely to show that Jesus makes good wine? No, I think it is reported because it has symbolic significance. The Jews were like people who had been drinking wine (performing ritual washings) so long that they could not recognize when something better came along. When Mary said, “They have no more wine” (v. 3), it symbolized the fact that the Jews had no spiritual meaning left in their ceremonies. Jesus was bringing something new and something better. In keeping with this theme, John next tells us that Jesus drove merchants out of the temple courts. Commentators write pages about whether this temple-cleansing was the same as the one the other Gospels report at the end of Jesus’ ministry, or whether it was an additional one at the beginning. In either case, John reports it here because of the significance that it symbolizes. John again puts the story in the context of Judaism: “It was almost time for the Jewish Passover” (v. 13). And Jesus found people selling animals and changing money — animals for sin offerings fellowship offerings, and other sacrifices, and money that could be used to pay the temple taxes. So Jesus made a simple whip and drove them all out. It is surprising that one man could drive all the merchants out. (Where are the temple police when you need them?) I suspect that the merchants knew that they should not be there, and I suspect that a lot of the common people didn’t want them there either — Jesus was simply expressing what the people already felt, and the merchants knew they were outnumbered. Josephus describes other occasions when the Jewish leaders tried to change the way things were done in the temple, and the people raised such an outcry that they had to stop. Jesus did not object to people selling animals for sacrifice, or changing money for temple offerings. He said nothing about how much they were charging. His complaint was simply their location: They were turning the house of God into a house of merchandise (v. 16). They had turned the religion into a moneymaking scheme. So the Jewish leaders didn’t arrest Jesus — they knew the people supported what he had done — but they did ask him what gave him the right to do this (v. 18). And Jesus said nothing about the inadequacies of the temple, but shifted the subject to something new: “Destroy this temple, and I will raise it again in three days” (v. 19). Jesus was talking about his own body, but the Jewish leaders did not know that. They no doubt considered it a ridiculous answer, but still they did not arrest him. Jesus’ resurrection shows that he had the authority to cleanse the temple, and his words foreshadowed its destruction. When the leaders killed Jesus, they were also destroying the temple, for the death of Jesus brought all the sacrifices to obsolescence. And in three days Jesus was raised, and he built a new temple — his church. Jesus was going to bring about the end of the temple sacrificial system and the end of the rituals of cleansing — and the Jewish leaders were unwittingly going to help him by attempting to destroy the body of Jesus. But in three days everything would be changed from water to wine — from lifeless ritual to the best spiritual drink of all. What do these two episodes have to teach us today? First, Christians might well wonder if certain of our traditions have outlived their usefulness and blinded us to new developments in what Christ wants us to do. It might be the holidays that we keep, or the way in which we keep them. It might be the way that churches are organized and governed. It might be unnecessary restrictions on who can do what. It might be attitudes toward evangelism. But we can do well to ask if our traditions have become as meaningless as water, and whether Christ wants to transform them into something more stimulating. We can also ask about our attitudes about money. Has money become more important to us than our relationship with God? We can certainly ask this from a denominational perspective, or from a local church perspective as budget committees are meeting. And we can ask it from a personal perspective, whether we might be letting commerce take over time that should be used for the community and people of God. Do we allow shopping and banking to occupy space in our lives that ought to be devoted to worship? Both of these are worth thinking about. You might also be interested in: What does the Bible say about wine?